The rolling green, fir and pine forested Ardennes Mountains in Belgium and Luxembourg are a military enthusiast’s dream with a high concentration of World War Two Museums sprinkled throughout. Clusters of stone walled farmhouses form rural hamlets, many boasting their own museum, because in December 1944 they were the sites of desperate last-ditch battles from the dying Third Reich. Known as the Battle of the Ardennes, (or the Battle of the Bulge in the USA), over two hundred thousand German and Allied troops were killed, wounded or captured in bitter fighting. One of the most exciting museums is the Ardennen-Poteau ’44 Museum with a number of working military vehicles, lovingly restored and maintained by museum owners Rob and Jacqueline de Ruyter. Their expanding collection of WWII equipment and vehicles, started in the 1970’s, has meant extending the museum twice since it opened in 1998. The vehicles are displayed inside and out. For a private museum the motorcycle collection is impressive: a Harley-Davidson WLA Motorcycle, a BMW R75 Motorcycle with Stein Sidecar, a BSA M20 Motorcycle with Sidecar, and a rare US airborne Cushman motor scooter. 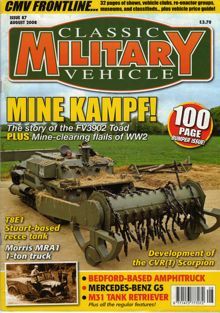 Most US automakers are represented with soft and hard skinned vehicles including the ubiquitous Willeys MB Jeep, a Ford M8 Greyhound Light Armoured Car, a Cadillac M5A1 Stuart Light Tank, two IHC M5 Halftracks, a Dodge WC51 3/4 –ton Truck, a Studebaker M29 Weasel Full Tracked Vehicle, and two White Halftracks (M2A1 and M4A1) and of course, the proverbial Chrysler M4 Sherman Medium Tank. German vehicles exhibited are the Sd.Kfz. 251 Halftrack, and an Opel Blitz 1.5-ton Truck. The German Halftrack (actually a Czech OT-810 taken into service by the Wermacht), and a US M5 Halftrack, drives excited kids (and adults) around in summer on a tour of the battlefield. A Soviet SU-100 Tank Destroyer also adds some interest. Be sure to look at the tank turret that looks like Swiss cheese, absolutely punctured and gouged with anti-tank rounds, sitting on the ground outside the museum. The museum is at a crossroads where the American 14th Cavalry Group ambushed the German Kampfgruppe Hansen on December 18, 1944. Foxhole trenches, dug by Americans, are still visible on the banks of the nearby river. The museum is packed with equipment, uniformed models, and well-presented dioramas, weapons, cannon, photographs and even loop films about the battle. You’ll need your own car to get to this museum-it is in a rural area. Visit nearby St. Vith to go on a sign posted walking tour of the town to learn about the battle that largely destroyed it. Opening hours, April 1 to June 14 each Saturday and Sunday from 1:00 p.m to 5:00 p.m. June 15 to September 15 daily from 1:00 p.m. to 5:00 p.m. From September 16 to October 31 Saturdays and Sundays from 1:00 p.m.-5:00 p.m. Also open by appointment. Admission, adults 6 euros, children 4-14 years 3 euros, groups 5 euros per person. © 2016 www.roy-stevenson.com. All Rights Reserved.